[ATTRACTIVE BOUNCE AND SQUEAK] - The toys will makes attractive sounds when your dog bite or press it. Catching the attention of dog, increasing the service time, could help the dog exercise more and have fun. [USE FOR CLEANING TEETH] - The lines design of ball can fully contact the dogs teeth, cleaning and keeping the health of teeth. Besides, when your baby dogs feels uncomfortable, they can use the ball to ease the uncomfortable. [SAFE AND POWERFUL MATERIALS] - Made of high quality bite resistant cotton material, healthy and longer use time. The cute, soft and cuddly plush toys can be washed, reduce dog sick when it become dirty. Help you save money. [ENJOY GOOD TIME] - When youre busy, you can let your dog plays alone, making him not feel boring! When you are free, you can play the ball with your dog in the open, increasing your intimacy. [VIVID& UNIQUE DESIGN] - 1 X plush hedgehog toy, 24hr pleased customer service. 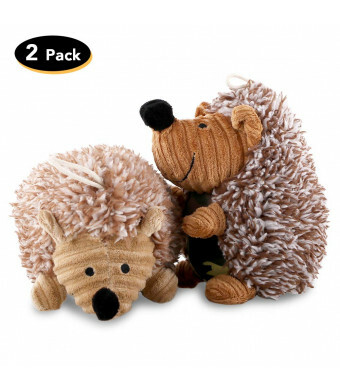 The cute vivid hedgehog animal design satisfy your pet s natural hunting instinct. This squeak ball fits small pets, such as Yorkie, Teddy, Chihuahua. 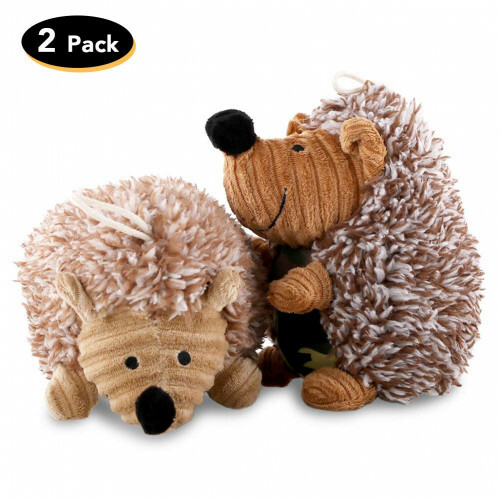 with this plush hedgehog dog toy squeaking every time they bite it! Make your furry friends world a bit brighter with an adorable stuffed animal laughing puppy toy that will entertain them at home, in the dog park or in the backyard! Cute, colorful and made from Non-toxic fabric, OAKZIP laughing puppy toy makes your choice for dogs of all sizes and breeds. 1. When you are not at home, they would be lonely. This toy could help the dog exercise more and have fun. 2. You can play with your dog. Puppy will excited to chase, bite, chasing and running. 3. The plush cover can be washed. When it become dirty, you can wash it. Longer use time and reduce dog sick. 4. It is the best toy for aggressive chewers to sink their teeth in and the ultimate teething toy for your little puppy. 5. The unique vivid hedgehog animal design satisfy your pet s natural hunting instinct. Your pet must will like it. If you have any questions, please feel free contact us, within 24 hours we will reply ASAP.